In the Arctic Fortress Jon is working on his science project. He is excitedly working on a flying saucer whose designs came to him in a crazy dream that had Krypto in it too. To Clark and Jon's surprise while working on the remote the saucer activates, converts itself into a box and tries flying away. Krypto grabs it but when Jon tries to pull it from his jaws it activates some kind of teleportation bubble and drops them in the sea off a strange island. The box tries flying away but as they give chase a giant prehistoric fish leaps out of the water and swallows Superman whole. Clark scans the interior of the fish and initially wants to cut his way out until he spots the creature's heart and gives it a gentle squeeze. The shock forces the fish out of the water and the Man of Steel out of its belly. Now free of peril the three begin an investigation of the island. They find an overturned US Destroyer with a large claw mark on the hull and an armored tank flipped on its side. Clark warns Jon to stay back in case of any old shells or munitions nearby and he discovers the remains of the crew inside. Using his heat vision he makes it a coffin so they remain undisturbed. Jon finds a crashed Japanese Zero aircraft and hanging from a tree above the long dead remains of the pilot who tried to parachute away. Clark decides the Smiths should return home and the three of them soar upwards but to his astonishment, Superman cannot see beyond the clouds. This strange pacific island seems sealed off from the rest of the world. Jon suggests they try to find the box and get it to send them home but suddenly a murder of pterodactyls attacks. One snaps shut on Jon's cape while the others attack Krypto and Clark. Superman flings the dinosaurs as far as possible while Krypto attacks Jon's captor. The Kryptonian canine notices too late he is being targeted and ends up in the belly of one of the pterodactyls. Jon snatches back his cape and leaps towards the dinosaur that ate Krypto sending it to the ground with a powerful punch. It works but that's when Jon remembers he cannot fly. Of course Clark cushions his fall just in time and they find Krypto clambering out of the dead dinosaur's jaws. The dinosaurs see them and fly away, something about where the Smiths are is frightening them. Clark turns to discover the skeleton of a tyrannosaur with a pilot's body inside. Clark examines the dog tag and finds the name John Cloud. They also find the graves of four other American soldiers. They see a mountain top nearby and Clark decides he might be able to see the transporter box from there better than hunting through the jungle. Krypto whimpers when they discover the skeleton of a dog at the mouth of a cavern. Story - 5: A nod to "Justice League: The New Frontier," "G.I Combat," "Our Fighting Forces". This is an intriguing change of pace to the stories we've seen so far and one that pulls Clark and Jon completely out of their newly established comfort zone of Hamilton County. It was easter egg aplenty for the long term comics reader, while taking nothing away from the newer or casual reader either. It would have been difficult to fit Lois into the story but it would have been nice to have them mention her even just a reference. What is she doing while her Super family is out adventuring? I expect it will be referenced soon, I can't believe she'd want to stay home. That secret zip tube, the enticement of the Hamilton Horn, it will be too much for her to shy from. It is only a minor thing but I would love for Lois to have some of the spotlight. Seeing Clark and Jon in action is just fun and this story arc is already promising some great twists. Something only hinted at is the dream that led to the teleporting cube. Who slipped the idea into Jon's dreams? A more than fitting tribute to Darwyn Cooke. Art - 5: The rotating art chores are being overlooked as the stories are really hitting the mark, but it would be nice for an artist to stick around and really give it their all. I'm not saying each artist isn't putting in the effort, but there is nothing like seeing a consistency in the teamwork. I've said before that Doug Mahnke is a creative genius and he doesn't disappoint here. The whole issue is breathtaking, with the attention to detail and the tiny nods to the books of the past I mentioned is not unnoticed (at least by me!) One thing... give Krypto a cape again please! Cover Art - 5: That pterodactyl isn't messing around! I hope it's ready to get a beating! This take is serious in comparison to the variant but still undeniably fun. 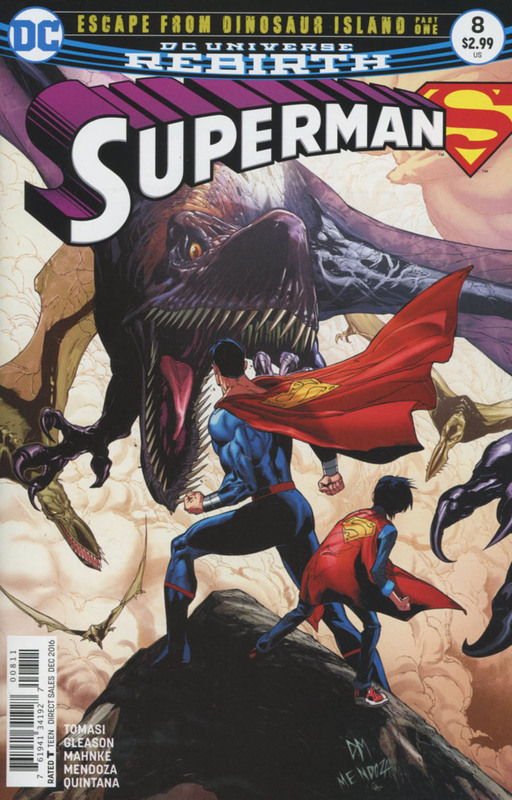 I love seeing Clark and Jon together in action, but the only downside I can reach for is that the artwork plays up the Dinosaur Island angle but not The Losers. 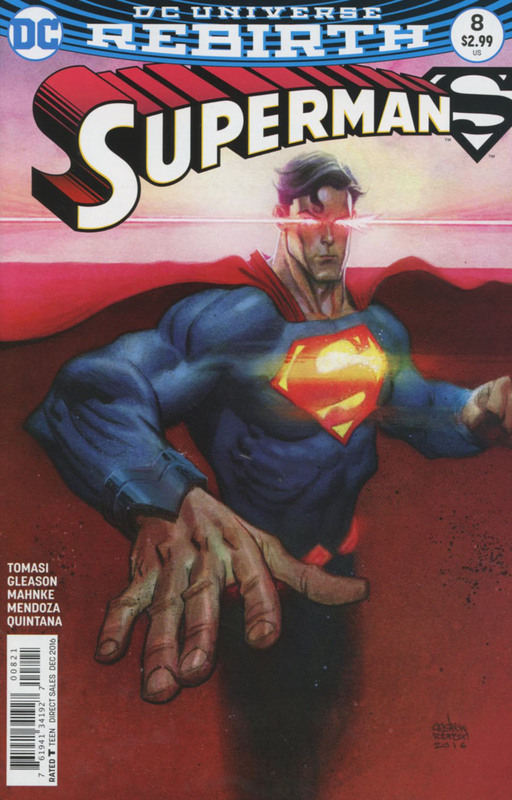 Variant Cover Art - 3: This cover shows Superman mid spin, undoubtedly about to dish out some justice but you know how, especially in movies today you freeze frame and the picture shows you something mid action that you aren't meant to see except as a glimpse? Like a cell of animation that's part of a sequence? Superman's vision shooting out in opposite directions and the giant hand give that feeling of mid action. Beautifully rendered but odd at the same time.